The long-running home improvement series This Old House kicks off its 39th season with a Four Square-style house originally built in 1879. 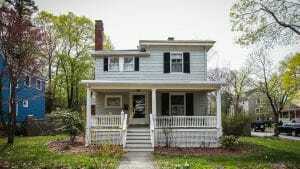 The team will renovate the 1,700-square-foot home located in Newton, Massachusetts. Homeowners Liz and Joe recently inherited the house from Liz’s mother. The This Old House crew will help renovate and expand it to accommodate three generations, including their two daughters and Joe’s parents. Later in the season, the team will travel to Charleston, South Carolina — a town rich in history, with many architectural gems in need of saving. The crew will help restore two of Charleston’s quintessential historic homes, both of which require extensive renovations to restore their original beauty, while making them functional for modern families. A focus of the season will be the next generation of skilled workers in the building trades. Host Kevin O’Connor, general contractor Tom Silva, master carpenter Norm Abram, plumbing and heating expert Richard Trethewey, and landscape contractor Roger Cook will be joined by trade students and up-and-coming professionals as America’s most trusted home improvement show shines a spotlight on the value of jobs in the building industry. By inviting the apprentices to join the crew, This Old House is expanding its Generation NEXT efforts and raising visibility of the need for new talent in the trades. This Old House‘s new season comes to CPTV Spirit as part of This Old House Hour, accompanied by new episodes of Ask This Old House, the show in which viewers’ home-improvement questions are answered. This Old House Hour will air Thursdays beginning October 5, 2017 at 9 p.m. on Spirit. These new episodes of This Old House and Ask This Old House will also air back-to-back on CPTV, Saturdays at 6 and 6:30 p.m. beginning October 7, 2017. For more on This Old House and Ask This Old House, visit ThisOldHouse.com.